ISMCR planning is well underway and we have received some very good abstracts from international authors. However, we have not received as many as we expected. To give more time to those who have not submitted their abstracts, we have EXTENDED the abstract submission date to May 10th. See the call for abstracts (PDF) for additional information. With regrets, the AIAA Houston section is canceling the “Civilian response to active shooter event training briefing” event due to low registration. The AIAA Houston Section is a proud technical sponsor of the 2019 International Symposium on Measurement and Control in Robotics (ISMCR). The symposium will focus on various aspects of international research, applications and trends of robotic Innovations for the benefit of humanity, advanced human-robot systems and applied technologies, e.g. in the fields of robotics, telerobotics, simulator platforms and environment and mobile work machines as well as virtual reality/augmented reality and 3D modelling and simulation. The symposium will consist of keynote presentations on the state-of-the-art technology, workshops and topical panels. All papers will have peer review and will be published with IMEKO and IEEE Guidelines. Submit your abstracts at the ISMCR website. The AIAA Houston section Cybersecurity Technical committee invites you to attend the dinner and training event. When: Fri, Apr 19th, 2019 5:30 PM – 8:30 PM Check-in and Network 5:30-6 PM, Dinner @ 6:15 PM Speaker 6:30-7:30 followed by Q&A. RSVP today on the event page or on Eventbrite. 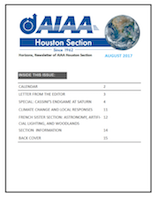 The 2019 AIAA Houston Section Annual Technical Symposium will occur in May 2019. Dates and locations are being finalized. We invite you to submit your abstract today! See the early warning flyer (PDF) for more information.